After almost three years of R&D, Uflex’s Cylinders Business has been able to optimise cell structures of laser engraved rotogravure cylinders that can result in 20%-25% lower ink consumption than what the electro-mechanically engraved counterpart would require to render the same image resolution and enhancement. In fact the printing output by a laser engraved cylinder is much enhanced and high-definition compared with printing by an electro-mechanically engraved cylinder. Explaining the recent breakthrough of lesser ink consumption in rotogravure printing, Uflex Limited Cylinders Business joint president Mr P K Agarwal said: "On the laser engraving set-up, our team has been able to create various modifications on honeycomb cell structure, line cell structure, TB cell structure and others which in turn during the print run render solid backgrounds, coating with high and low depths, other specialised coatings, vignettes, half tone images among several others. "Typical cross-sections of an electro-mechanically engraved cylinder having conventional cell structure and a laser engraved rotogravure cylinder having modified/ optimised cell structure are shown herein below." Mr Agarwal continues: "It is all about the shape and structures of the cells that we have been able to modify and optimise through the process of laser engraving. This is not possible in electro-mechanical engraving which can only produce conventional cell shape/structure. "From the cross sectional images one can clearly understand that the volume of ink entrapped in the conventional cell structure achieved through electro-mechanical engraving is much more than that in the modified/optimised cell structure achieved by laser engraving. Further, the face opening of the laser engraved cell structure is much more than the conventional cell structure hence less volume of ink is transferred on larger area of substrate. So, effectively you get more print coverage with lesser amount of ink by laser engraved cylinder having modified/optimised cell shape/structure. "We carried out a comparison test under Standard Operating Conditions (for the same printing job) with White Solvent Ink (for continuous tone) using an electro-mechanically engraved rotogravure cylinder having conventional cell shape/structure and a laser engraved cylinder having modified/ optimised cell structure. The viscosity of ink used was 14 Saybolt Seconds in both the cases. "The results in terms of ink saving have been extremely impressive. The ink consumption in the second case was almost 22.5% less than that in the electromechanically engraved cylinder having conventional cell shape/structure. This is quite a feat in terms of savings towards the running costs incurred by a convertor of flexible packaging." Commenting about this achievement, Uflex Limited chairman and managing director Mr Ashok Chaturvedi said: "This is a classic case of process improvement for the converting fraternity of flexible packaging. I am glad that making the most of the laser engraving technology my team of engineers at Cylinders Business has been able to modify and optimise the cell structures of the rotogravure cylinder thereby bringing a substantive reduction in ink consumption during printing. "Not only does this bring down the operating costs of the convertors but also makes the printing process reasonably eco-friendly. 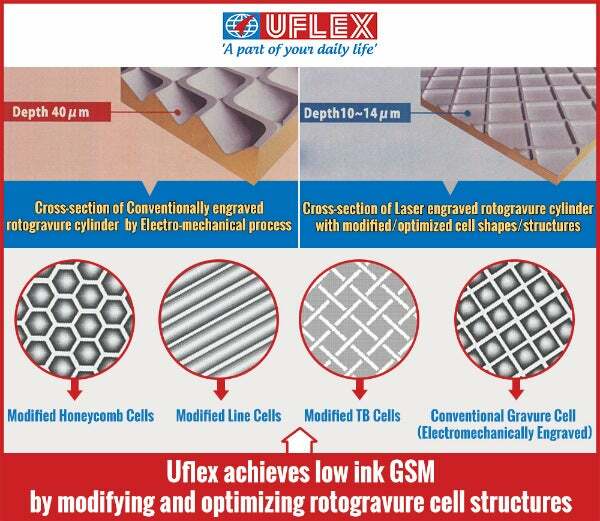 I congratulate Team Uflex for successfully achieving low ink GSM for rotogravure printing."